One of my creations for a special: Talk about bold flavors. Warm Spinach pasta topped with crisp spicy arugula salad and sweet cherry tomatoes. 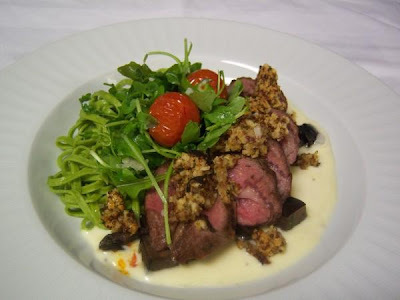 Served with the King...roasted lamb with a Dijon mustard crust drenched in a creamy Parmesan sauce.